David Freese, as we know, has had a tough season so far at the plate. A couple days off after his batting average reached .163 a week ago did lead to getting two hits each in the first three games against the Brewers and, although he was 0 for five Sunday, his average is now up to .215. Is the slump over? Is he back on track? And what’s the best way to deal with a slump, anyway — and to end it? For insight on the latter question, I asked Wayne Tyson for his thoughts. Wayne was a high school and community college baseball coach for 26 years, and one of his players included a current MLB All-Star. Here’s what he had to say about handling slumps, both as a player and as a coach. Every season, hitters go in slumps. Often, when they come out of them, they come out in a hurry. All players get in a slump here or there, and some would even say, humorously, that their entire career is/was a slump. If you want to check out how bad slumps can be or how to get out of one, all you have to do is Google “batting slumps.” In less than 10 minutes, I found out that there are more than two dozen things that can put a hitter into a slump, and umpteen ways of getting out of one. The fact is, you can’t put a number on the reasons a guy will go into a slump, just as you can’t put a number on getting out of one. As a player, I only recall having one dry spell at the plate. Luckily it was during our fall practice season as opposed to the regular season. I was something like one for 23 – uh, yes, the numbers of a slump can stick with you – during our fall intra-squad games. While I never hit for power, I ran well and seldom struck out, while using the whole field. But there I was, stuck in a quicksand of oh-fers. It was frustrating, to say the least, and a bit embarrassing. It seemed that everything I hit went right at someone, even when it was well-struck. We had a very close team and, if there was any kidding, it was done to lighten my mood, not to make fun of the situation. Players often won’t make too much fun of you when they’re afraid they might catch the same malady. Knowing I had made the team – it was my sophomore season, and I had earned a scholarship the previous year as a walk-on – didn’t help much. You see, even in games that don’t count, players want to think they’re contributing to the team – and I certainly wasn’t. Playing three or four games a week, the whole thing lasted probably 10 days – the longest ten days of my baseball life. How’d the slump end? I was facing Jim Wagg, a crafty southpaw who couldn’t throw a ball straight and never threw two pitches in a row that were remotely the same speed. Being a left-handed hitter didn’t make the situation any better for me. He threw me a pitch over the outer third of the plate, and I swung at topped it down the third base line. Unintentionally, it resembled a perfectly placed bunt. I legged it out easily, got another hit in the game and never looked back. And I also have never forgotten. While coaching at the junior college level, we had a player who was killing it. He was hitting around .520, spraying line drives all over the park. He had average speed at best, but possessed gap power, and could pull the ball or take it the other way. It looked for sure like he would lead the state in hitting. Then one day a teammate who knew something about numbers did the math and told him he would still be hitting .300 if he went something like two-for-50. He had an oh-fer game, and then another. His line drives were always at someone, and there were less of them. There was some teasing, but things just got worse. He never struck out and, all of a sudden, he was heading back to the plate with some regularity. It was like the entire field was a huge Wilson or Rawlings glove. Well, he didn’t make it. He went two-for-52 or something like that and fell below .300. Then he suffered an anxiety attack and couldn’t complete the season. It was tough to watch, and I think of him often. And that was back in the early ‘80s. A third little anecdote on the slump. One of the best players I ever coached was a perfectionist. He wanted to be perfect in the batting cage, during on-field batting practice, and in games. His freshman season, he went one-for-10 in one slump and two-for-10 in another. Three-for-20, and he was going crazy. He felt as if he was capable of better, and that he was letting the club down. Plus, he had never experienced anything like this before. Throughout each three-game slide, he hustled and worked hard. His sessions in the cage were tremendous – he was hitting bullets all over the place. But when he got into games, he was trying too hard. He snapped out of the second slump, and went on to hit for average and power over the rest of that season and the next two. All I told him was to relax, keep working hard and not to try to be perfect. He could hit. Oh, and I kept him in the lineup. He broke out of the second slump, and never had another one in the following two seasons he played for me. I won’t mention his name, but you know it — he’s an MLB All-Star. He can flat-out hit, and he plays every day. And he makes people around him better, just because of his smile and his energy. All three of the slumps I mentioned revolved more around the psychological aspect of the game than anything else. That led to swinging a lack of patience at the plate, which will lead to a lot of additional problems for a hitter. All three slumps also involved a bit of bad luck, which can’t be accounted for sabermetrically. In both of the players I coached, I recall them hitting the ball well at some point or other, but hitting the it right at someone or just missing their pitch, which would result in a long out rather than an extra-base hit. Take a look at all the sites Google has on the hitting slump. As I said before, there can be countless reasons for getting into on, and countless ways of getting out of one. It’s not as easy as putting the blame on mechanics or confidence. You can’t just “break out” of a slump because you put more time in the cage. There are too many factors involved for it to be that simple. Slumps are just a part of baseball. The better the hitter, the more the world knows when he’s struggling at the plate. He just has to believe, keep at his craft, take everything one pitch at a time and hang in there. And every hitter needs to remember that if he’s never been in a slump, he’s due for one. If he’s in a slump, he’s due for a hit! Wayne Tyson was a high school and community college baseball coach for 26 years including six years at Florida Air Academy. His FAA team won the Florida Class 3A State Championship in 1998 and was runner-up in 1999. Wayne currently writes for Cowbell Clankers, the Aerys Sports home of the Tampa Bay Rays, and the Aerys MLB site Around the Horn. Follow him on Twitter @WayneTyson11. Ordinary people go into slumps, too. In fact, I can cause anyone to go into a slump by just getting them to think about what they’re doing — ask somebody to explain the act of walking as they’re strolling down a corridor. They’ll start to slow their stride, and they might even trip over themselves as they start to think about the different motions that go into the act. Then they’ll have to re-set their mind to stop thinking about walking so they can go back to normal. But then, we don’t want David Freese to stop thinking about walking. Pitch selection is one of his better traits. The psychological part is fascinating to me — baseball and otherwise. Case in point: Rick Ankiel. 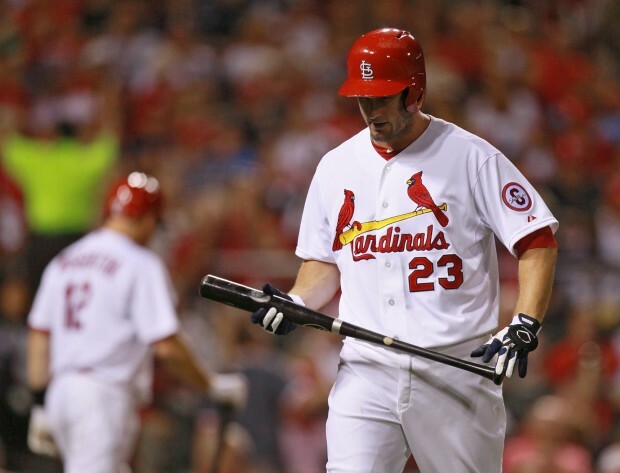 As for David Freese, he must be thinking too much again: 0 for 4 last night.